Lately Noah has been obsessed with the swiffer and broom. My mom has a maid who comes one day a week and I think he just watches her non stop and wants to join in the fun. 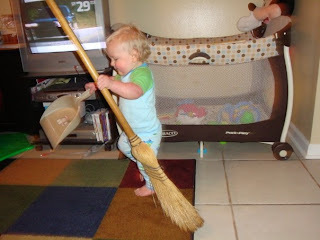 Well, one day he found the broom and swiffer and went to town! It's hilarious. He really thinks he is cleaning. This kept him occupied for almost an hour. It was really cute.